Recap - Oakland ties the series as Red Sox fall. 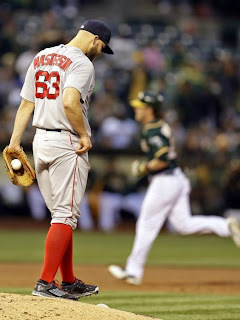 Red Sox winning streak (of two games...) came to and end when Justin Masterson was on the mound, and the Athletics losing streak finally snapped. Oakland attacked the Red Sox early with three runs in the 1st, with a single from Josh Reddick and a homer from Stephen Vogt. The Athletics went into batting practice mode with Masterson again in the 2nd with a double from Eric Sogard and in the 3rd with a homer from tonight' Oakland's hero, Josh Reddick. Masterson didn't last long in the game, as Steven Wright went into relief at the bottom of the 3rd and allowed two runs, which Masterson earned. While the pitching was being well, as usual, the offense wasn't helping either. The Red Sox were hitless through six innings until surpisingly, Shane Victorino hit a double. A groundout from Bogaerts sent Victorino to 3rd base, and Blake Swihart drove him in in the next at-bat. In the 7th inning, Pedroa lead off with a single and after Hanely sent him to 3rd, Napoli drove him with a single. Oakland scored again in the 8th inning, when Reddick drove in another run after a walk from Crisp and a single from Marcus Semien. The hopes from a comeback were shattered when the score was 9-2. Justin Masterson allowed six runs in 2 1/3 innings, while Steven Wright allowed eight and practically gave the bullpen a day off. Fun fact: When Reddick made his debut with the Red Sox in 2009, he was taking the roster spot from Justin Masterson who had just been traded to Cleveland. Do you think (or hope) that this was Justin Masterson last start? Will Steven Wright have a spot in the rotation? Leave your comments below and don't forget to follow us on Twitter at @RedSoxLife.